He sits in his old recliner after dinner. I don’t think he intends to go to sleep, but inevitably, he is snoring peacefully soon after Jeopardy, or these days, sometimes even before. When I say snoring, I don’t mean merely loud breathing while asleep. Accompanying the usual sounds you might expect are hums and sighs and, if he’s dreaming, mutters. He will go on this way until the nightly news comes on, which he will awaken just long enough to hear before going to bed. To his right, with a be-lamped table between them, sits his wife. She is sitting in a reclining loveseat, her feet up, heating pad pressed to her back, usually sleeping right alongside him. 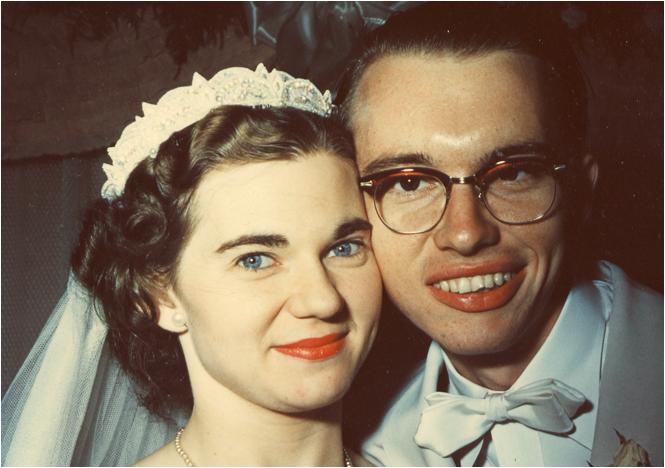 These two are my grandparents and they have been married for fifty-five years. My grandfather is tall and thin with skin tan from spending long days outside running his miniature trains around train parks across the country. His hands are calloused from working all his life in bakeries and in basement workshops and with his trains. My grandmother is petite, her hair set in short, light blonde curls, her skin fair, her fingernails immaculate, her eyes a beautiful bright blue. She’s worked alongside him, raising two children, and in their later years, traveled around with him and his trains for as long as I can remember, including their annual trip down to Florida every winter until recently, when her health became a concern. Their RV sits dormant now, its years of service rewarded with a suitable retirement next to the garage. And now, I think my grandparents are settling completely into their retirement as well. Their journey together began in 1948. Lee Wehlann was hired to work as a baker at Heinrich’s Bakery in Detroit, Michigan as a junior in high school. While he was working back in the kitchen, Theresa, the daughter of the owner, Godfrey Heinrich, worked in the front. After work one day, he and five other people crammed into his little car and went for ice cream. Theresa, among them, squeezed into the front seat between him and another young man who worked with Lee in the kitchen. After that, one thing led to another and Lee wound up asking Theresa out to dinner to a Swedish smorgasbord he liked and she accepted. They dated steadily until he joined the service in 1952. By then, Lee knew Theresa was the only woman for him. He would have proposed before joining the army, but did not want to leave Theresa engaged to a man who did not have all confidence in his return if he were deployed. Instead, they stayed close until he was discharged in November 1954, very soon after which he asked Theresa to be his wife. 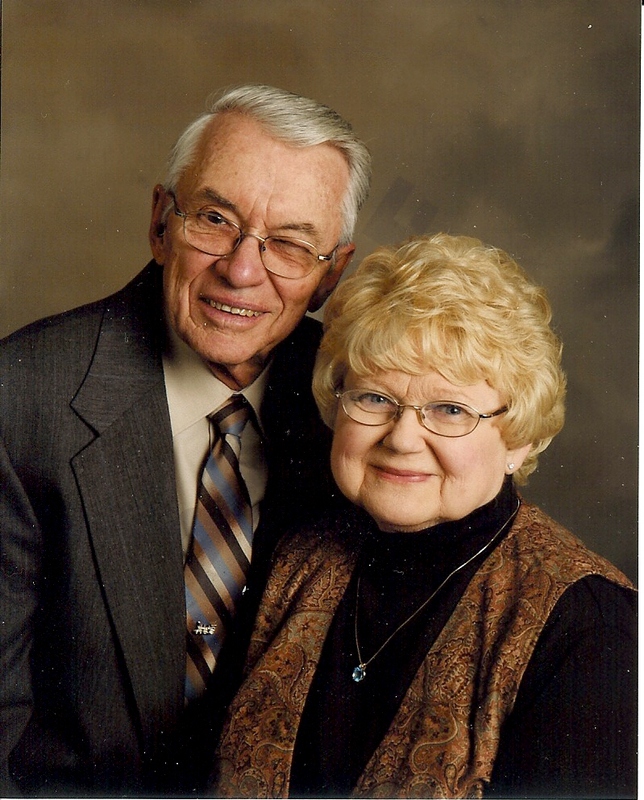 They were married August 13, 1955. The employee marries the boss’s daughter. Together, they started their own bakery, The Nook, in 1971 on the east side of Detroit and continued running Heinrich’s Bakery until selling the business. Together with their children, Judy and Don, and a handful of other employees, Lee operated the bakery and Theresa taught cake decorating and candy-making for nearly ten years before opening another Nook in the fall of 1981 in Centerline. They sold the first Nook on Gratiot Street in December of 1983 and focused their attention on the Centerline Nook until Lee’s retirement in 1995. The Wehlanns were a typical, hard-working, blue-collar Detroit family, Lee rising early, often at two or three in the morning, to start getting ready for the breakfast crowd at his bakery, Theresa teaching cake decorating and candy-making to her students later in the day, their children joining them after school. Though they spent their lives working long and hard, often with little together time in the evenings, as many families had, Lee and Theresa always made family a priority, even if it meant that family time was spent working. Their son, Don, my father, recalls that the greatest life lessons he learned were taught by his parents’ example in their bakeries – the value of hard work and the fair treatment of employees and customers as it applied both to business and their personal lives. Judy remembers watching her mother teach cake decorating and candy making at the Nook alongside Theresa’s mother, Anna. She remembers her mother working hard to keep the house together, especially the laundry. My grandmother would spend hours in the basement doing laundry and ironing. She had an upright iron, the likes of which you might see in a tailor’s shop or a drycleaner’s, and used it to iron everything from bed and table linens to her husband’s handkerchiefs. Theresa and her mother-in-law took sewing classes together, learning a skill Theresa used well into my lifetime, and would often bring Judy with her. Their love was shown by the quality of the time spent with their children, rather than the quantity. In the summers, Sunday was family day. Every Sunday after church, they took their children sailing in Upper Pettibone Lake, about an hour’s drive northwest of Detroit. In the winter of 1967and 1968, Lee and Don built a sixteen-foot Sunfish sailboat in the basement to sail on the lake, an experience both children remember. My father still remembers hauling that boat on its side up the stairs and out through the back door. The boat is still in existence and is currently hanging in the rafters of Judy’s garage. They traveled with Don and Judy in campers, first in an eight-foot pop-up and later in, what Judy refers to as a “twelve-foot box,” all over the country and even into parts of Canada with Lee’s parents. This not only built memories for themselves and their children, but also demonstrated their love for them in ways my father and aunt might not have fully understood at the time. In order to take these vacations, my grandparents had to shut down the Nook for up to two weeks, sacrificing the needed-income they would have received in order show their children the wonders of their available world and experience those wonders with them. In many ways, this shows a greater love than money-bought luxuries ever could. My grandfather made time for his son, specifically, while working in their basement workshop, building model planes and teaching him how to fix and build things, something he has passed on, in his own way, to my brother and I. That’s not to say Judy didn’t get some time in the workshop as well. As a little girl, perhaps four or five years old, she can remember bringing broken toys to him while he stood at his workbench and saying, “Daddy, fix.” A little while later, her toys would be returned to her, fully-functioning. It was the little things they did that really meant the most. They did not have much money to spend on their children, but the gifts they have given them in the form of life lessons and practical experience can carry no price tag. My father, now a pastry chef himself, received years of experience in the kitchen long before going to culinary school. My aunt, now an accountant, got her first real business experience working in the second Nook and, during her senior year of high school, by more or less managing the bakery while her mother was ill. My father and aunt both learned the value of a dollar and the satisfaction of a hard day’s work, something they have been able to pass onto their own children. No matter what spat or argument you might have with your husband or wife, make up before you go to bed. Because in the light of day, the realization of the big picture will dawn on you – this is the person, the gift, I’ve been given to share my life with and they, and the life we share together, are more important that whatever we might argue about. And it’s worked. Through fifty-five years of marriage, good times and bad, financial success and setbacks, sickness and health, joy and sorrow, they have remained partners in business and in life. Best friends. Even their arguments, such as they are, are cute. Their life together has been long and happy and they wouldn’t change a thing.